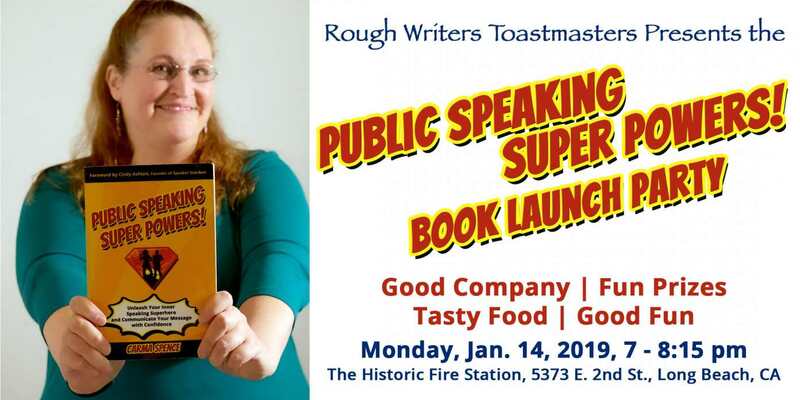 LONG BEACH, Calif. - Dec. 15, 2018 - PRLog -- Rough Writers will host the official book launch party for "Public Speaking Super Powers" by Carma Spence on Monday, January 14, 2019, from 7 to 8:15 pm. The event, which will be held at the Historic Fire Station, 5373 E. 2nd St., Long Beach, CA, will include an educational presentation, superhero-themed activities and a prize drawing. During the event, attendees will learn about the journey from idea to published book, participate in a rousing round of Tag Team Table Topics, and have the opportunity to win fun prizes. There will also be Superhero Cityscape backdrop for photo opportunities and refreshments will be provided. Participants are encouraged to wear a Superhero T-Shirt to receive one entry in the prize drawings. Additional entries are $1 and benefit the Rough Writers Toastmasters Club, a 501(c)(3) organization (must be present to win). "Rough Writers has been an integral part of my author journey," said Spence. "I'm so happy and honored that they are hosting the launch party for my latest book." To register for this event and for more information, visit https://publicspeakingsuperpowers.com/book-launch-party. With more than 200,000 members in 9,300 clubs worldwide and in approximately 80 countries, Toastmasters is the largest nonprofit organization in the world devoted to improving the quality of people's lives through the development of communication and leadership skills. Carma Spence is an author, speaker and mentor who helps women, introverts and shy people unleash their content creation superpowers and communicate their message with confidence so they can create a meaningful and fulfilling legacy. The Amazon Bestseller "Public Speaking Super Powers" is her fifth book and was a Top 10 Finalist in the Author Academy Awards. For endorsements of the book, visit https://publicspeakingsuperpowers.com/what-people-are-saying.